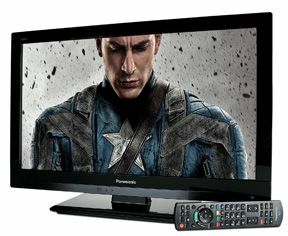 Panasonic TX-L24E3 review | What Hi-Fi? There are some firsts here. This is the first Full HD, 1920 x 1080 screen we’ve tested that’s smaller than 32in; it’s the first 24in screen we’ve ever tested (though it’s unlikely to be the last); and when you calculate the price-to-size ratio, this is one of the priciest TVs of any kind we’ve seen. But like Sony’s £380 KDL-26EX320, the L24E3’s spec goes some way towards justifying what looks, at first glance, an optimistic price-tag. There’s that Full HD resolution, obviously, but LED backlighting, Freeview HD, an SD-card reader and Ethernet all add to its appeal. is ready to go in next to no time. And with a Blu-ray of True Grit to display, it looks splendid. We’d always suspected that the difference between 1920 x 1080 and, say, 1366 x 768 resolution would be negligible at this size, but that’s not the case – the deep, detailed blacks, strong contrasts, prodigious detail levels and deft way with skin-tones and textures all contribute to a brilliantly watchable picture. And that’s before excellent motion tracking and a wide-ranging colour palette are factored in. Freeview HD images are pleasing, and the L24E3 does good work downscaling DVDs too. Sound is reasonable, all things considered, and fights sibilance well. Even better, the ‘game’ mode means its reactions are fast enough to satisfy the bedroom gamer. All in all, then, this is a little belter for those than can afford it.